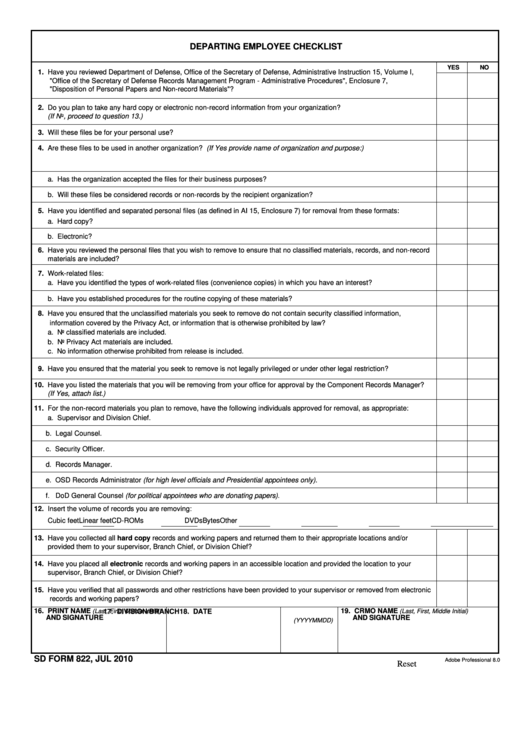 Download a blank fillable Sd Form 822 - Departing Employee Checklist in PDF format just by clicking the "DOWNLOAD PDF" button. Complete Sd Form 822 - Departing Employee Checklist with your personal data - all interactive fields are highlighted in places where you should type, access drop-down lists or select multiple-choice options. "Disposition of Personal Papers and Non-record Materials"? 2. Do you plan to take any hard copy or electronic non-record information from your organization? 3. Will these files be for your personal use? a. Has the organization accepted the files for their business purposes? b. Will these files be considered records or non-records by the recipient organization? a. Have you identified the types of work-related files (convenience copies) in which you have an interest? b. Have you established procedures for the routine copying of these materials? information covered by the Privacy Act, or information that is otherwise prohibited by law? a. No classified materials are included. b. No Privacy Act materials are included. c. No information otherwise prohibited from release is included. 9. Have you ensured that the material you seek to remove is not legally privileged or under other legal restriction? 10. Have you listed the materials that you will be removing from your office for approval by the Component Records Manager? a. Supervisor and Division Chief. e. OSD Records Administrator (for high level officials and Presidential appointees only). f. DoD General Counsel (for political appointees who are donating papers). provided them to your supervisor, Branch Chief, or Division Chief? supervisor, Branch Chief, or Division Chief?